If you are looking for random domains then our random domain name generator tool is the one all you need. Though we call it random domain generator but actually it will present you domain names from our exclusive and handpicked domain name database just like our brandable domains. 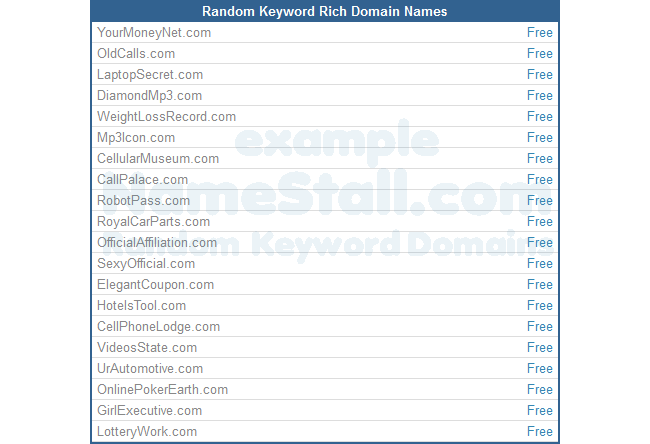 And NameStall�s random website name database contains only keyword rich domains since all of them are specially selected. You may not know yet what type of website you want, but you know that you want to use a keyword domain name strategy. If this is the situation, our random website name generator is the perfect tool for you. It may spark your website or business ideas. On the other hand, you might have a business or website plan in your mind and know the type of name you want. If it is the case, a random domain name generator may not help you. In this case, we suggest you to use our domain name generator or domain name suggestions or brand name generator tools. And if you have some ideas in your brain then you can use our instant domain search tool to check those domain names availability Instantly. We believe if you spend few minutes with any of those tools, you will end up with some great keyword rich domain names for you website or blog or business. Our random keyword domain names will be a big help to you. Search our lists for a name that fits what you are searching for. Enjoy all the advantages of our random keyword rich domain names. You will see an increase in traffic, especially if your web address contains common keywords. Consider which keywords are commonly searched for and try to incorporate these when possible. Maybe you already know the sector of your company or website. If this is the case, use our tool to ensure your desired name is available. If not, search names for one that comes as close as possible to what you want using our other domain tools.